Wash the meat pieces very well. Squeeze out all the water very well. Mix together 11/2 tsp of ginger and garlic paste each, 1/2 cup curd, salt, yellow powder, 1/2 cup of coriander and mint leaves and green chillies without removing the top stalk. Mix thoroughly well the above mixture with the mutton. Keep in the refrigerator over night or for at least 2 - 3 hrs. Add onion and saute, till they turn brown. Add 1/2 spoon of ginger and garlic paste each and fry well. Add garam masala powder and fry well. Add 1/2 cup of mint and coriander leaves and fry well. Add the marinated mutton and stir well. Cover and cook on a low fire, till the mutton is cooked. Stir occasionally. When the mutton is being cooked, heat up another big vessel. Add water, bay leaves, cardamom, cinnamon sticks and cloves and allow it to boil. 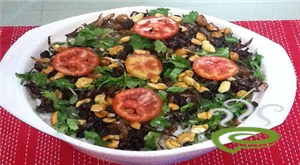 Add rice, salt and another 1/2 cup of mint and coriander leaves. Cook, till half done and strain the rice. :- Remember not to overcook the rice. :- Use a big vessel so that the rice does not stick with one other. :- Cook, till half done as the rice will get cooked in steam later. 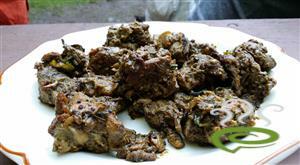 Once the mutton is cooked, there should not be more water in the mutton. If there is more water, then keep the flame high and open the lid and stir. 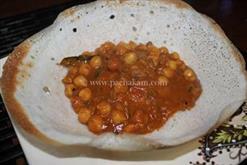 :- In short, there should be thick gravy with the mutton. Add the cooked rice into the mutton gravy. Add 2 tsp of ghee/oil on the rice (optional). Mix together 2 spoons of water and red/yellow colour and pour this liquid in the center of the rice. Cover and keep on low fire for 15 mins. Open and check whether steam is coming out. If yes, cover it again. Open it and before serving, mix half quantity very well so that each rice is coated with the mutton masala. I am so thrilled I came across your recipe. 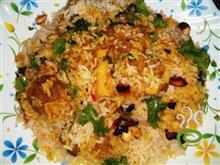 I am not a very confident cook and mutton briyani has really scared me. But yours has just boosted my confidence so so much. bless you. I was praying that God would guide me to a good briyani recipe. This was His answer. Bravo Lorreen. 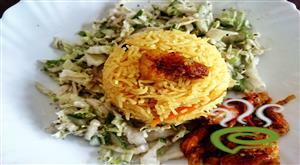 Very easy way of making lovely Biryani. Everybody liked it. It was same like Arab Udupi Resturant`s Biryani. this is a very good recipe only thing we cooked mutton well but rice after half cooking when mixed to the gravy its taking long time to cook well and dry it completely.still its on the stove. I am a Keralite and my family loves mutton biryani very much, we alwasy get from hotels, becuase when i treied at home, it was never sucess, but you recepie has become hit in my house... now i have made this recepie 2 times and everbody likes it specially my husband and motherinlaw. 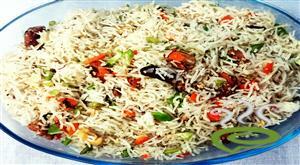 Thansk for this good way of making biryani. I have tried this recipe and it is lovely!!! Hi, I tried this recipe. Very tasty and liked it a lot. My family enjoyed it too.The second time I tried, instead of cooking rice seperately, I added the rice with Cardamom, elachi, cinnamon, bay leaf to the half cooked mutton and it came out really good. Thanks for a wonderful recipe. THANKU FOR THIS RECIPE,I TRIED CAMEOUT WELL,ONLY ONE VARIATION I MADE IS I CHOPPED THE GREEN CHILLIES WHEN I MADE IT SECOND TIME . Guests coming in...try this recipe..it was delicious. I tried biryani for the first time and the result was awesome...although marinade time was just half an hour for me...still the outcome was excellent....recommended strongly.